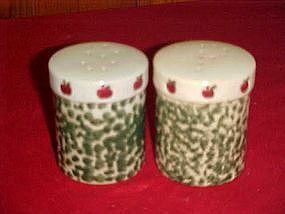 Nice large soneware shakers are green sponge painted and have apple border at the top. They have their stoppers and measure 3 1/4" tall. S and P in the top for the pour holes. Excellent condition.